Bank fishing is basically fishing at the water’s edge, where there is shallow water. Usually, bank fishing is done by casting baits or lures in the water so that the fish come forward to eat it. The typical equipment used in bank fishing are rods and reels, lures and baits. However, people also perform bank fishing with nets, spears, traps and also fishing lines without any rods. Bank fishing has its own advantages and disadvantages. 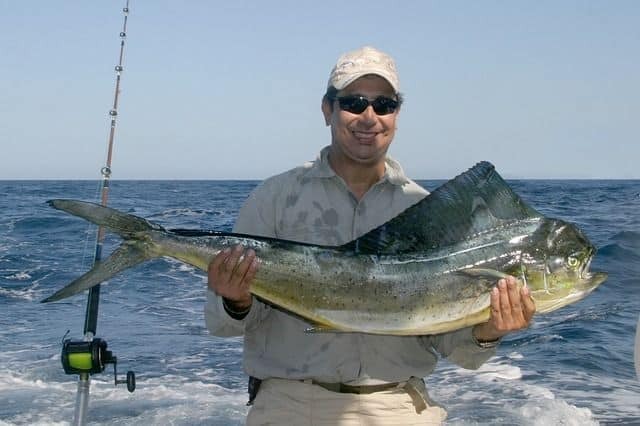 A lot of factors come into play in such a kind of fishing, such as knowledge about the area, knowing about the depth of water, the structure of the bank, the timing and location for fishing, and even the types of baits and lures that are used for fishing. There are a couple of things that anglers do in order to ensure that their bank fishing trips are a success. You can do the same and see if it works for you. The very first thing that one should do before starting bank fishing is to mark the target from beforehand. Being able to line up and marking target areas isn’t as easy, however, when you’re limited to bank fishing. If you happen to find a good place, it is extremely important that you fish repeatedly there. 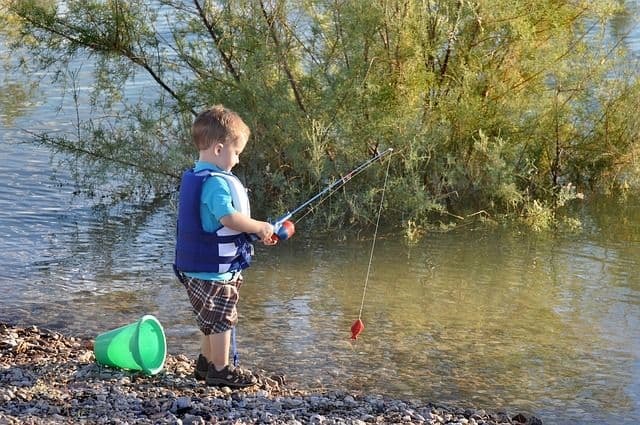 Since fishing near the shoreline means you have limited access, you shouldn’t leave any potential spot and cover every bit of space that you can get your hands on. You would be happy to hear that it is possible to find a lot of fish swim near the bank and in shallow waters all throughout the year. So you’ll always have something to catch. Fishes such as big basses and pond basses remain year round and so you shouldn’t just test the deep waters, but also try your luck in the shallow waters. Whether it is big water or small water situation, the important task for bank fishing is to cover as much water as possible. If you don’t have a boat to help you fish, you can always walk in the water and make as many casts as you possibly can. The trick here is not to stick to one place for long but to always be on the move. If you make plenty of parallel casts, there is a high chance of you scoring some fish, since your bait remains in that particular area for a long time. You may either be on a boat or walking when you are bank fishing. Staying in one place for long will do no good, so keep moving across the water until you find some fish and then work from that area and cover the entire place to not miss out any fish that might be gathered there. One important thing to remember though is that you should not move too soon. Fish are able to sense vibrations underwater, and any sudden movements are sure to scare the little fellows away. Whatever you do, don’t simply stay at one point hoping that you’ll catch one by the bank just out of sheer luck. When you start bank fishing, one essential factor is to keep things as minimal as possible and to just explore as much as possible. Since you have to be on the move a lot and don’t pack heavy as that will limit your mobility. It may sometimes be better to keep extra options available as backup for emergencies, but not as necessary. Instead, one good idea could be to make a fishing-kit where you can include only the essentials that you will need. The idea of wearing a dark outfit might scare you, especially during the hot summer days, but surprisingly, dark clothing helps in catching shallow water fish, such as bass. You don’t necessarily have to wear all black and dark, but a nice black shirt or dark colored pants will really pay off. Bright colored clothing can often scare the fish away even before they come close to the bait you set for them. Fishes such as bass, often look out for food or for protecting their young fries. Keeping far distance from predators is, therefore, a tactic for them, but if you wear bright and bold colors, then rest assured that not one of them will come near you. Any dark colors, even darker shades of green or blues will help you to blend in with the surrounding trees and water bodies, and work as a form of camouflage. When you reach your favorite pond, don’t jump in immediately. Not only will you scare off the fish, but you are also most likely to return home empty-handed. Instead of letting the fish sense your presence, try to catch them off guard, as that will allow you to catch as many as possible. Don’t worry about seasons and water levels as some big pools always have shallow water levels all year long. So, as mentioned previously, choose a targeted area where you think you will find a good catch, and make a few casts there. After you cover one area entirely, then later you can move on further to the water and catch some more using different casting angles. One surefire way to make sure you catch some good fish is to know what will scare them away. To prevent that from happening, you need to be patient and employ stealth. Don’t simply maintain a safe distance from water as already mentioned in the previous point, but also follow some other techniques in a calm and careful manner. It might be very tempting to talk loudly or shout out to your fishing mates over the water but refrain yourself from doing so. When nearing the bank, it is better to almost tiptoe instead of stomping on the ground. The fish might be little, but they sure can sense every little vibration. Bank fishing or shoreline fishing is already critical; therefore, you need to understand how proper casting angles work. Since there are already a lot of basses that swims near the shallow waters, you can start here and then slowly make your way closer into the water. To make the most out of fishing in shallow waters, cast your rod parallel to the bank. For this, you might need to put some extra effort sometimes, and lean a little further than necessary in order to set your cast. To position the shallow big bass nicely, you can make a long cast and slowly bring the bait closer to your shore. After a few casts, you can choose to divide the area you’ve targeted into smaller sections or grids to make quartering casts in the shallow water. If there is any shallow base anywhere near, you wouldn’t miss catching it with such a brilliant technique. If you didn’t know already, the surrounding environment can provide a lot of helpful cues when setting up for some bank fishing. Important environmental cues such as wind and shade from the sun, are extremely important. When there seems to be a lot of heavy winds, always remember that it can blow specific fish, such as plankton, baitfish, panfish, and bass towards some very predictable areas in small ponds. Because of this, windblown banks are a good target area since there is a huge possibility of getting a lot of fish there. If the area you choose keeps you surrounded by a lot of trees, sometimes it may be hard to make your cast. But nonetheless, they provide great shade from the sun’s scorching rays. Some fish are found under shades, where the temperature of the water is comparatively cooler and also comfortable as there isn’t much light. If you don’t seem to find any cover, look for some shade spots such as under a fallen tree or near a stump, where you are most likely to find some fish. If you happen to choose such an area which is windblown and allows you to cast with proper angles, then rest assured that you’ll have quite a catch that day. You must have heard professional anglers suggest about applying the bold techniques before applying the subtle ones. As a result, we are often told to pick the most colorful and eye-catching baits first, so that we can catch some of the most aggressive fish before the rest. However, what most of us tend to misunderstand is that pond bass and shallow water bass aren’t going to be attracted by such loud baits, but would rather get very frightened and swim further away. If you don’t want to scare those poor fish away, then it will be best if you use simple baits while casting for the first few times. You cause a weightless bait which won’t cause much vibration when entering the water and would seem very natural looking features which wouldn’t seem threatening to the fish. If you are unable to maintain silence and keep your calm when fishing, then be sure that you won’t be able to catch any. Fish, especially bass, are extremely sensitive and can sense even the slightest of vibrations. If you have a habit of talking loudly while fishing or stomping your boots or dragging them when moving around in the water, then it is definitely going to be a very tough job to catch any fish at all. If you want to catch fish, simply maintain a fair distance, say about 10 feet from the shoreline and make your casts. The distance and absence of vibrations will make the fish feel more secure and come towards your baits. Anglers may suggest a whole lot of different things depending on what each of them prefers. While bank fishermen will suggest casting away from the bank, you’ll find boat fishermen asking to cast towards the banks. With such confusions all around, you might be left to wonder what the actual technique is, and what’s going to work for you. Well, you will be able to reach the most productive depth zone only if you make 45-degree casts from the shore for bank fishing. Unlike the straight casts, the angled casts are going to let you maximize the time on the most productive depths and also teach you where most of the bass are located. Basically, you should target certain depth ranges every time you cast and think of the entire system as a grid. This will make things easier for you and also make sure you catch quite a number of fish. Bank fishing is actually very relaxed and once you get the hang of it, you will soon be able to catch a lot of fish within a very short time. Now that you know a few bank fishing tips and tricks on how to have a successful bank fishing, you should be able to haul a good catch the next time you go out on a bank fishing trip. Just relax and simply follow the tips you’ve come across in the article. Hopefully, the techniques you learn in this article will help improve your fishing skills a great deal. Hi, This is David. I love fishing and it’s my hobby. I have been fishing for the last 5 years. Based on my experiences with fishing, I am sharing my opinion about fishing tips and fishing equipment so that a beginner can get started right away. Find me on Twitter here. Happy reading!